Every shower needs a cake (or in this case, cupcakes! 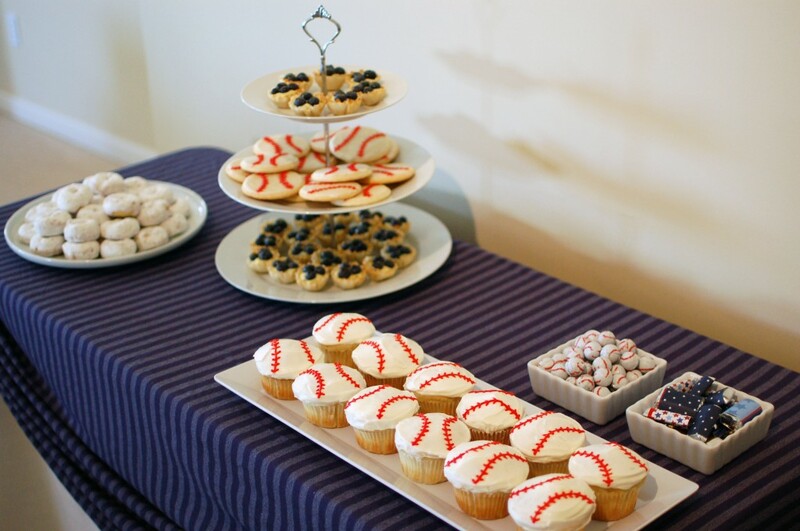 ), and what better cake decoration at a Baseball Baby Shower than baseballs themselves? For these cupcakes, the red icing is the real star of the show; you can use any white cake and smooth-ish frosting as a base. 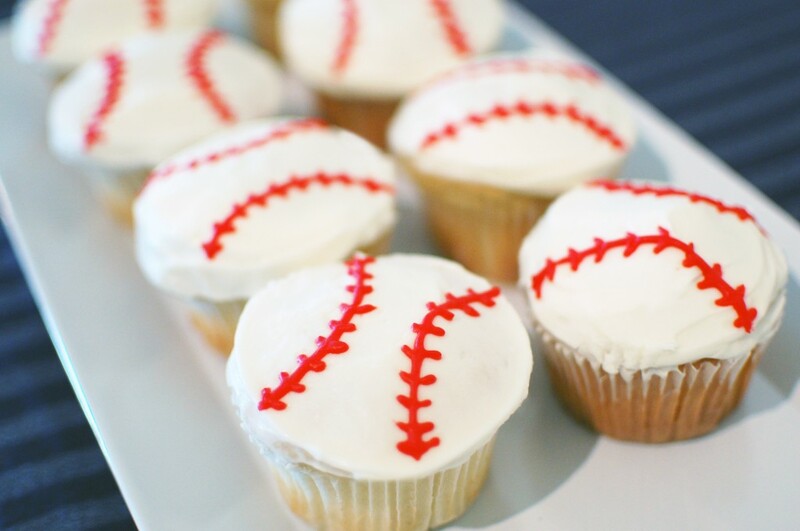 While hunting for inspiration, I came across a number of “baseball cupcakes” with flat baseball discs just stuck on top of them, but I couldn’t make sense of them! 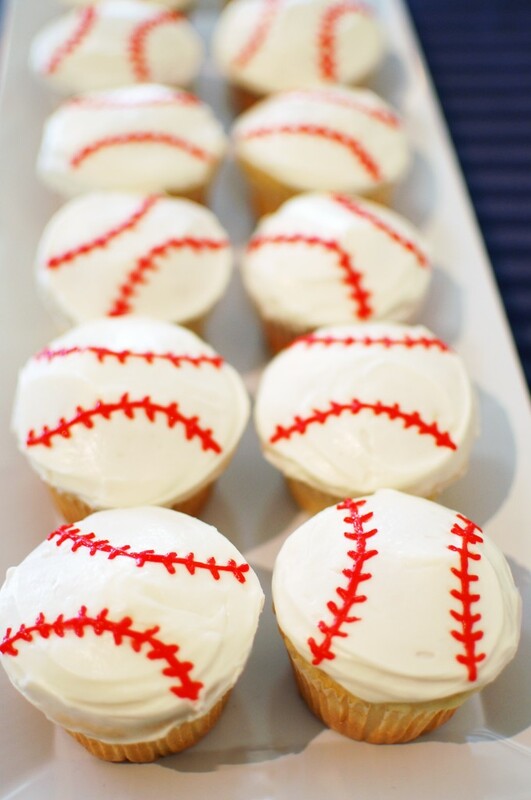 Baseballs are round and so are the tops of cupcakes! I chose to put the laces right on the surface, and found a coconut cupcake recipe praised for its domed tops. My recipes came from the Cupcake Doctor (also known as the Cake Mix Doctor). She calls for a whipped cream frosting with coconut flakes on top, which sounds absolutely perfect if you aren’t making baseballs! But because I needed a stronger, smoother frosting to add laces to, I went with the Cupcake Doctor’s coconut cream cheese frosting. 1. Preheat the oven to 350. Line cupcake pan with 20 paper lines. 2. In a large bowl, combine the cake mix, coconut milk, oil, eggs, and coconut flavoring. 3. Beat on low for 30 seconds. 4. Scrape down the sides, and beat on high for 2 minutes. The batter should look well-blended. 5. Spoon 1/3 cup cake batter into each cupcake liner, filling it three quarters full. Remove any empty liners. 6. Bake until lightly golden and they spring back when touched, 18-22 minutes. 7. Cool in pan on a cooling rack for 5 minutes. Remove cupcakes from pan and let them cool completely on the cooling rack before frosting. 1. In a large bowl, beat cream cheese and butter on low until combined, about 30 seconds. 2. Add the confectioners’ sugar, a little at a time, beating on low until sugar is well incorporated. 3. Add the coconut extract. 4. Increase mixer speed to medium and blend until fluffy, about 1 minute more. For the laces, use my mom’s sugar cookie icing, but cut down on the milk a bit (it takes a ton of red food coloring), and go heavy on the powdered sugar. The icing can’t be the slightest bit runny or it will ruin the tiny laces!